The Lapdogs had the opportunity to review several items from Healthy Dogma and couldn't wait to yap all about them... and neither could I! As a very concerned pet parent when it comes to what they're eating, I couldn't be happier to introduce you to this amazing company. Healthy Dogma believes that everything you feed your pets should be natural, organic and beneficial to to maintaining healthy bodies. This results in the highest quality food, treats and supplements with NO wheat, corn or soy! Even more important, all items are Made in the USA! We received two kinds of the all-natural dog treats for review, Nutty Apple Barkers and Cherry Hippie Barkers. If you're like me, the first thing you might notice is their adorable packaging. The treat containers totally remind me of take out popcorn chicken! What you can't see in the picture of Teutul guarding them is the "For good dogs only" printed on the side - I told you their packaging was cute! 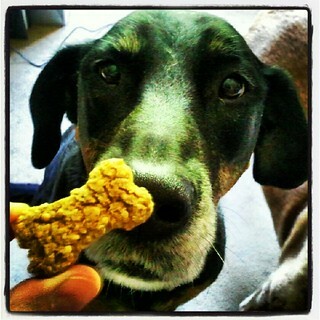 The Lapdogs love both varieties of treats and I love that each one is made of natural, wholesome ingredients. It's as if I made them myself at home.... shhh! Nutty Apple Barkers contain peanuts, apples, hulled mullet, whole grain oats, rye flour, olive oil, vanilla, powdered milk and ascorbic acid (source of Vitamin C). They have such an amazing peanut butter smell that I almost want to eat one myself! Cherry Hippie Barkers go one step further with ingredients to support healthy joints. I am always on the lookout for joint support treats for Zeus and it's definitely an added bonus when he actually likes them. As you can see, he likes them... he really, really likes them! 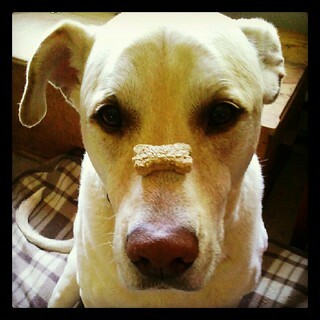 In fact, Cherry Hippie Barkers get him to do tricks for treats! Ingredients are hulled millet, whole grain oats, rye flour, tart cherry extract, olive oil, vanilla, powdered milk, glucosamine and ascorbic acid (source of Vitamin C). I love that these supplements come with a handy little scoop which allows you to easily measure and sprinkle in over your dog's food! No mess, no fuss... and the Lapdogs gobbled it all right up in their food! Healthy Dogma treats and supplements have received the Official Lapdog 16 Paws Up Seal of Approval, as well as their Mama's woo-hoo seal of approval for not only being wonderful products and Made in the USA, but for their creative packaging and ease of use! Head on over and like their page on Facebook, follow them on Twitter and of course, visit their website to order direct. 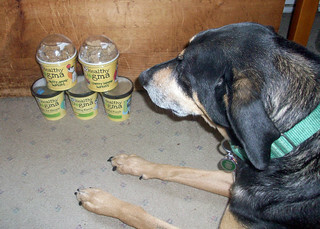 The Lapdogs think every pooch out there deserves some Healthy Dogma this summer and urge the pet parents to stock up! Turns out we have three flavors of their treats in the house. The girls love 'em.